The simulator rapidly tests pledged emissions’ reductions for sustainability – and lets participants at facilitated sessions see the resulting implications from both a local and a global “context-based” sustainability perspective. For example, the Contributors screen below shows different emissions reduction pledges from various stakeholder groups (residents, the local college, and other sectors). These reductions are from a percentage reduction perspective, where the percentage is relative to a projected baseline of “business as usual” (BAU). The Who contributes…? 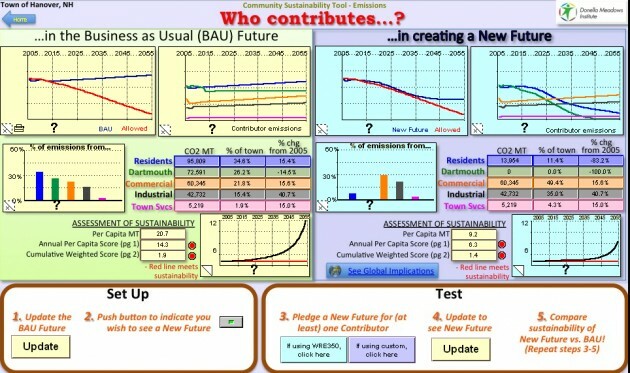 screen below then compares the sustainability of the pledged future with the BAU future. The closer the blue line adheres to the red line, the more the community is staying “on the path” to sustainability. Similarly, the sustainability assessment metrics shown in the center of the screen indicate the effectiveness of emissions strategies. Scores less than, or equal to, 1.0 are sustainable; the greater the scores from 1.0, the less sustainable. The scenario here is a dramatic improvement over the BAU future, and provides stakeholders with an understanding of how they all need to contribute – and that returning to acceptable levels of emissions is doable, even if it may be difficult.